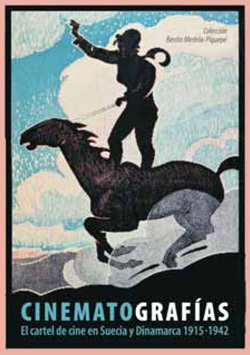 Throughout the 20th century, and particularly during the first four decades, the production of posters was highly significant, both in terms of artistic proposals but also for the business world which was keenly interested in finding new advertising formulas in tune with the aesthetic of the times. The weight of the phenomenon led the autor Blaise Cendrars to state that “the spectacle was in the streets.” That is to say, that modern art had left its customary venues of galleries and museums to enter into closer contact with the general public and everyday life. Though this utopia was brutally cut short by World War II, it nonetheless laid the foundations for what graphic designers and advertising art would eventually become. Thus, there were posters dedicated to war, to peace, to trade, to political propaganda, to sports event and also to showbiz. They were ephemeral serialised works that nevertheless possessed (and indeed still possess) great efficiency and visual accuracy and, in most cases, an aesthetic boldness that put them on a par with paintings and sculptures from the same period. That is the reason why posters have made their way into museums. Largely thanks to their documentary value but also to the formal postulates they proposed. The Swedish and Danish posters features in this exhibition are devoted to cinema, perhaps the most representative technological and artistic contribution of the 20th century. Besides the aesthetic renewal defining these desings, we must also underscore their huge relevance for they embody an aesthetic in consonance with the patterns set by modern art and also for their representation of a poster art that has a personality of its own, different from the practices carried out in the rest of Europe and in the USA. Therefore, this show provides the publica an opportunity to engage in a reencounter with great films and movie stars from the past, but also to discover a repertoire of images that, in spite of the time has elapsed, still surprise us for their singular and modern features. ¿Desea reservar un ejemplar de Cinematografías. El cartel de cine en Suecia y Dinamarca 1915-1942?